Yesterday I travelled to Peterborough to attend my friends Emily and Christopher’s wedding. 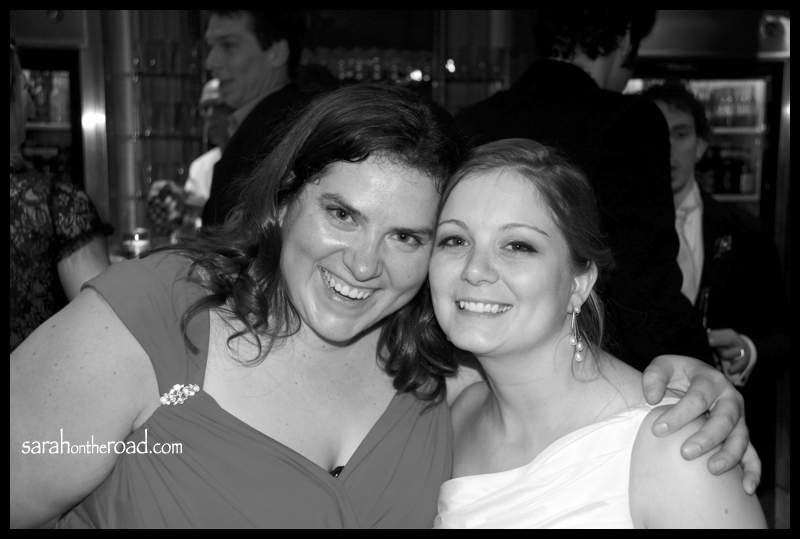 Emily and I met during the summer of 1997 during a Leadership-in-Training(L.I.T.) Program at a summer camp and quickly became friends. Even though Emily and I have never lived in the same cities at the same time…she’s managed to help me find my first apartment in Toronto, my first job in Nunavut after finishing my Masters..the only thing left on the ‘list’ is a man. Emily I’m still waiting! Emily and I have also spent a few New Years Eve’s together… I met Christopher at some point in early 2010, I was in Ontario for a weekend at another friend’s wedding. Emily and Christopher drove to Toronto from Peterborough to have some sushi with me! Christopher is one of those people that after meeting you feel like you’ve known them forever. Since that day…I’ve crashed on their couch many times when I’m back in the area. But this story is all about Emily and Christopher! They had such an amazing, beautiful evening wedding. After the ceremony we all put on our coats to stand in front of the church with sparklers so they got some awesome shots walking through the path of ‘light’! 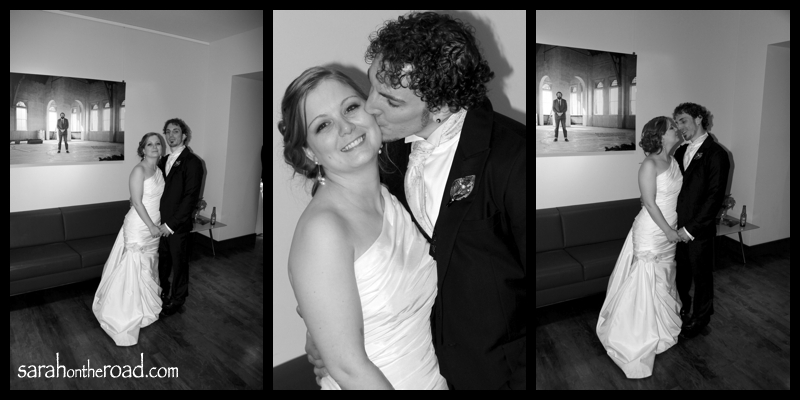 Their reception followed at the Market Hall Performing Arts Centre…which has been newly renovated and was an amazing venue, and with Emily and Christopher’s love for the arts it was the perfect spot to hold their reception! I’m going to leave you with one of the readings that Emily and Christopher had read during their ceremony. It’s a favourite of mine as well! 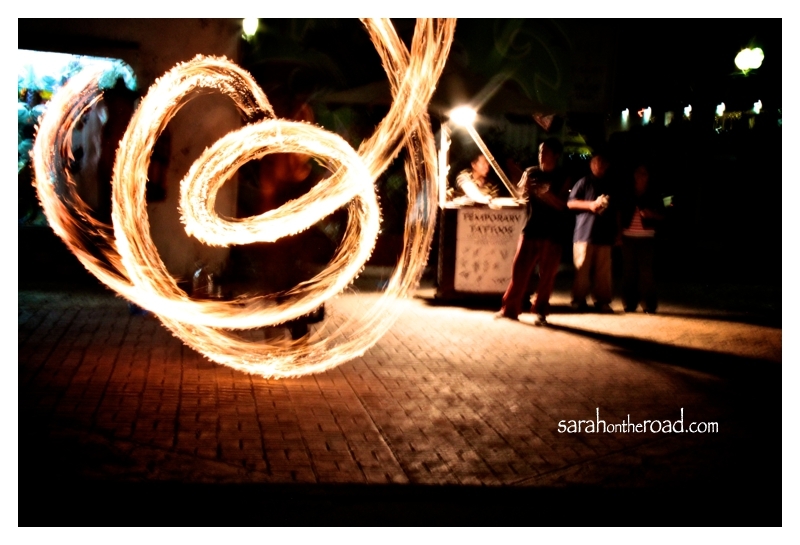 Disclaimer: I feel really bad, I carried my camera around with me all night..but didn’t take many photos at all. 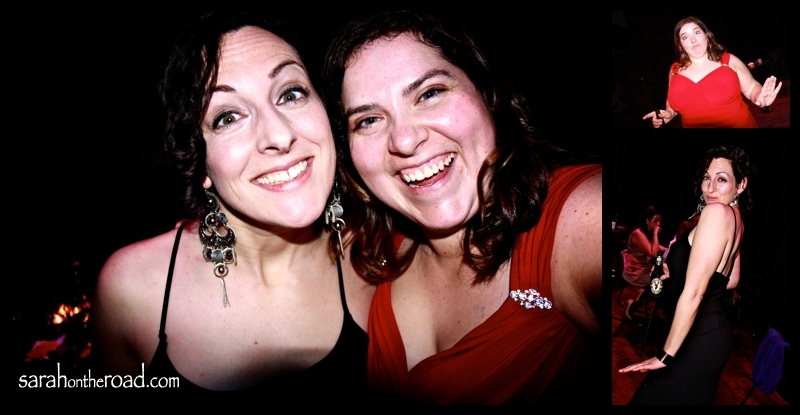 Didn’t get any of me alone in my killer dress and heels…none of me and my date…or other friends at the reception! I suppose you put a girl in a dress and heels when she’s not use to it and well she stops taking photos! 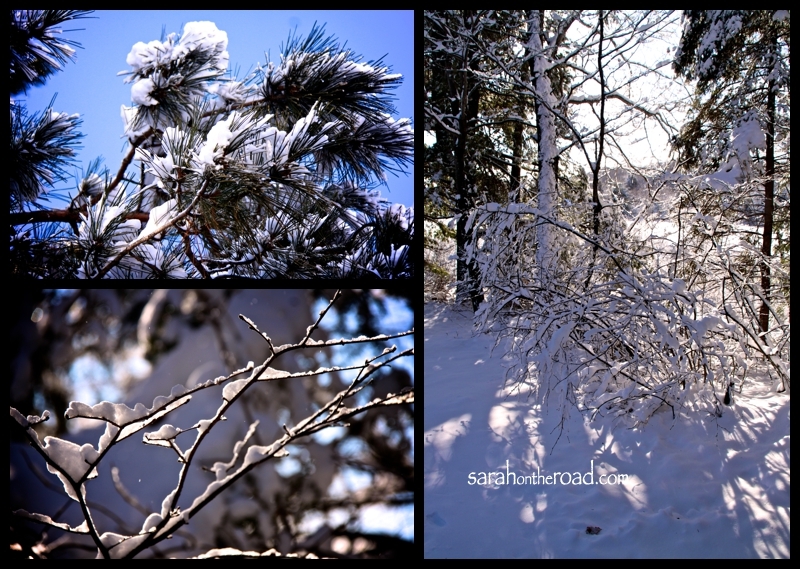 This entry was posted in Friends, Visits to Ontario and tagged Weddings on December 31, 2011 by Sarah on the Road. Today I had the opportunity to catch up with my friend Krista. 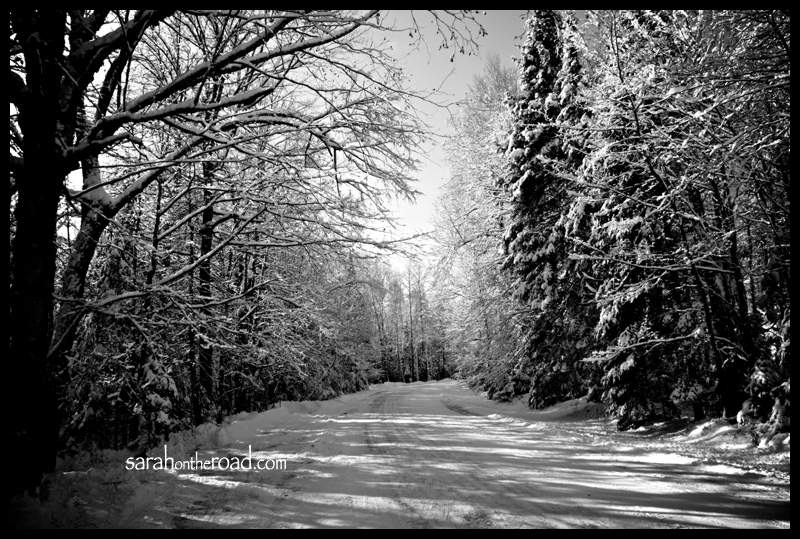 Krista and I met back in January 1985 on my first day in Kindergarten in Haliburton. We’ve been friends since day 1! I think that means in January we will have been friends for 27 years! I dug out my mum’s photo albums and managed to find a few photos of us together at my 6th Birthday Party in December of 1985. 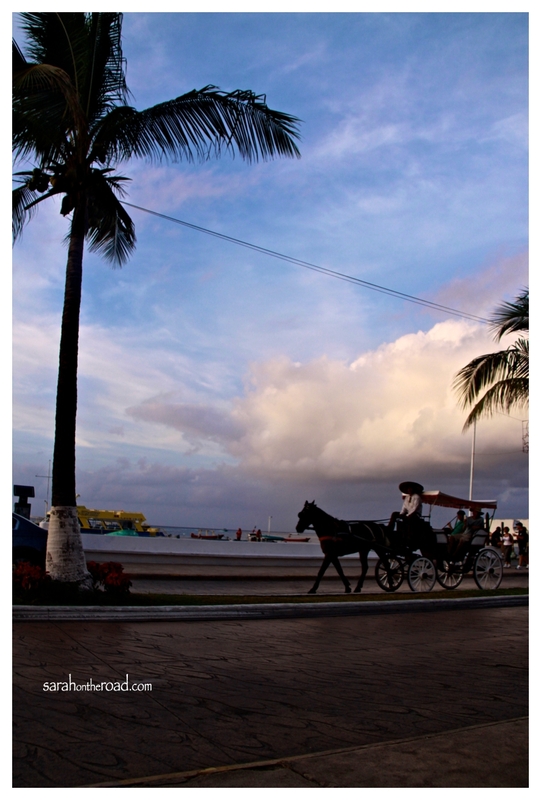 It’s really hard to see the ‘true’ beauty in these photos…but well a photo-of-a-photo can only do so much! 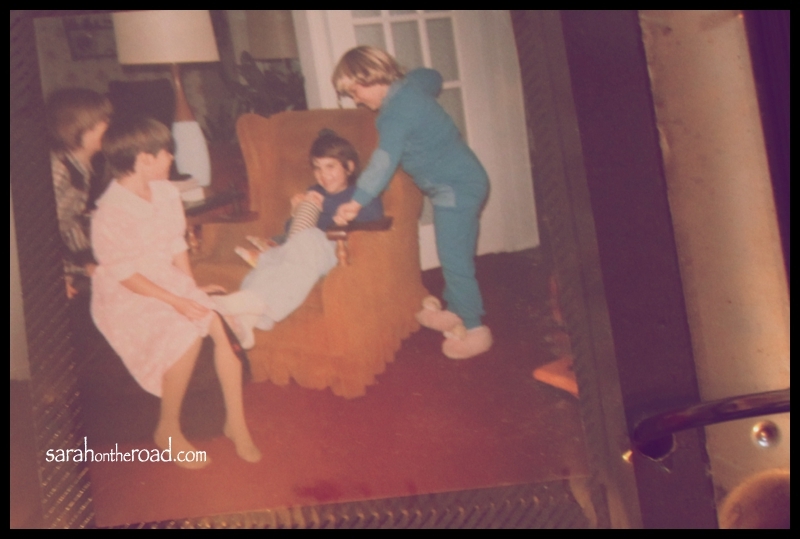 I’m sitting in my Grandpa’s chair..(in the dark blue shirt…with the BOY haircut; I think resulted because I wouldn’t let my Gramma or my Mum brush my hair-they threatened to cut it if I didn’t let them…and apparently I learned that lesson the hard way!) 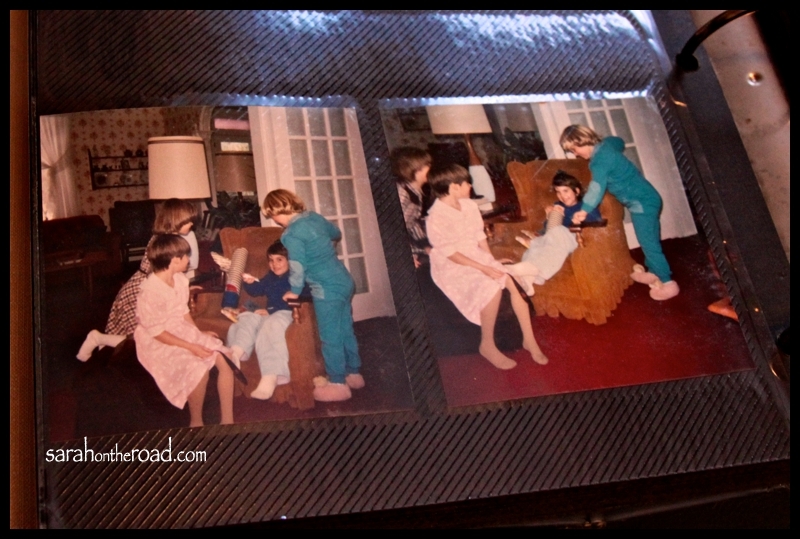 Krista is in the gorgeous teal blue tracksuit… with her cabbage patch slippers I so wanted a pair! I love how Jammie and Amanda were dressed in dresses for my party… and Krista and I were sporting our best tracksuits…growing up in the mid 80s nice fashion! I guess I’ve always been a bit of a tomboy..and ALWAYS hated wearing dresses!!! It was only Krista and her mum that got me a dress and convinced me to go to Prom in Grade 12. 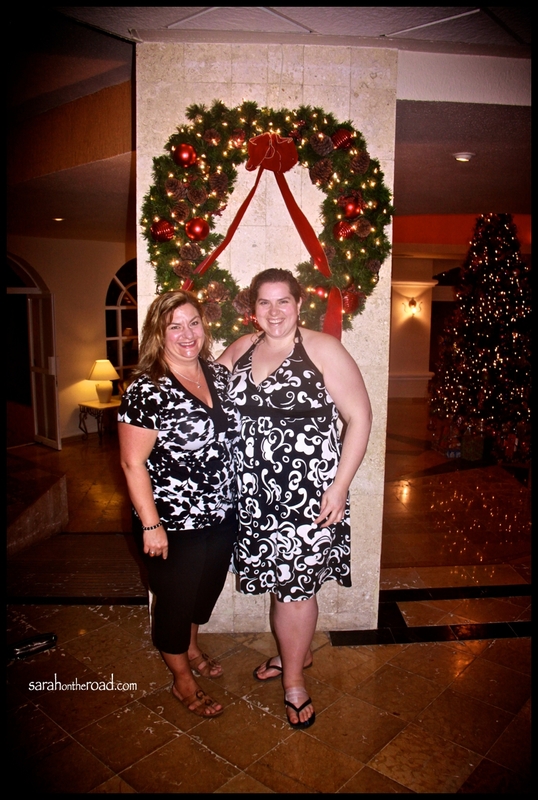 Without Krista I would have never gone! 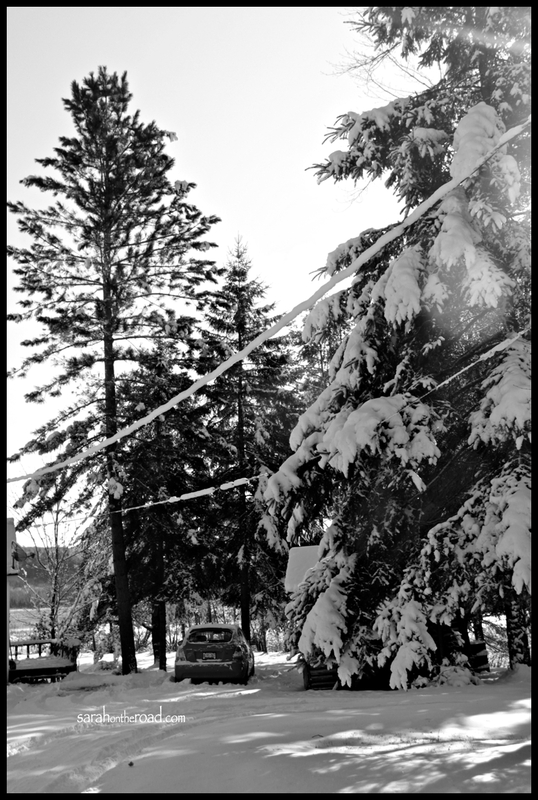 I remember our school years fondly…there were summer camps, sleepover parties, movies Friday nights at the Molou, weekends on the ski hill… along with all the other growing up drama of being friends, and then not friends, and then friends again! There are many, funny stories, jokes and memories. 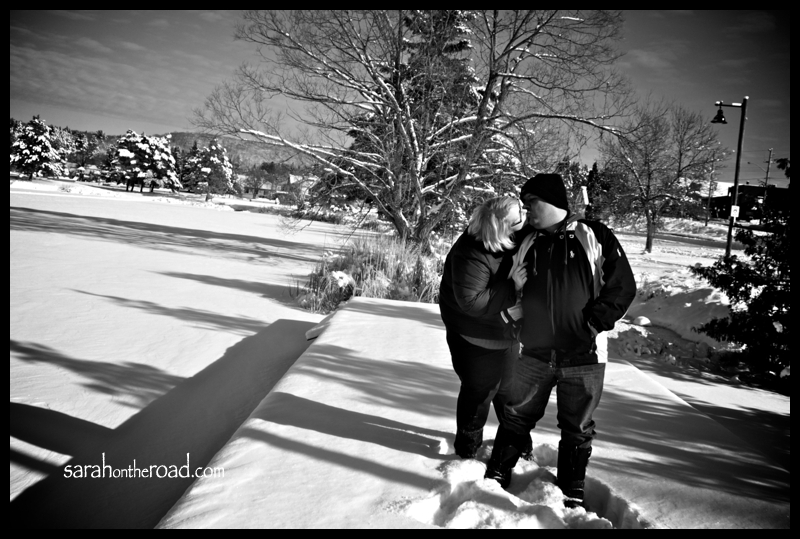 In 2010, Krista met Tas… they have had a whirl-wind, fairy tale kind of love story. Tas is Australian. They met and it was love at first sight and got married in the Fall of 2010. 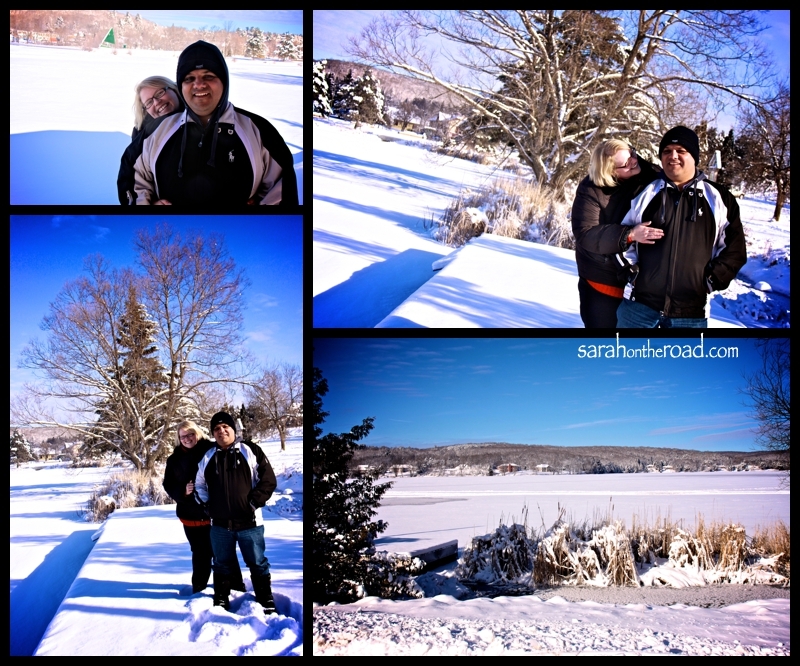 Sadly, I couldn’t make it back to Haliburton for their wedding, or to meet Tas. 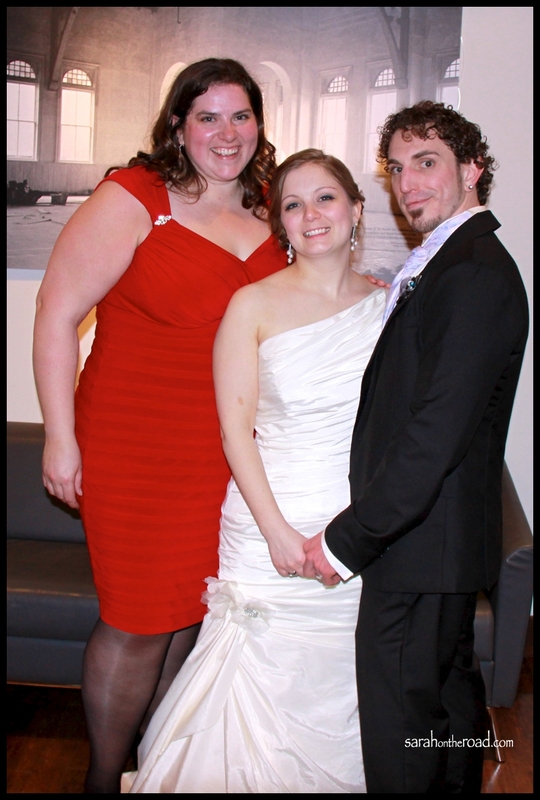 I was living and working in Winnipeg and because of work commitments I couldn’t make the flight back for the wedding. 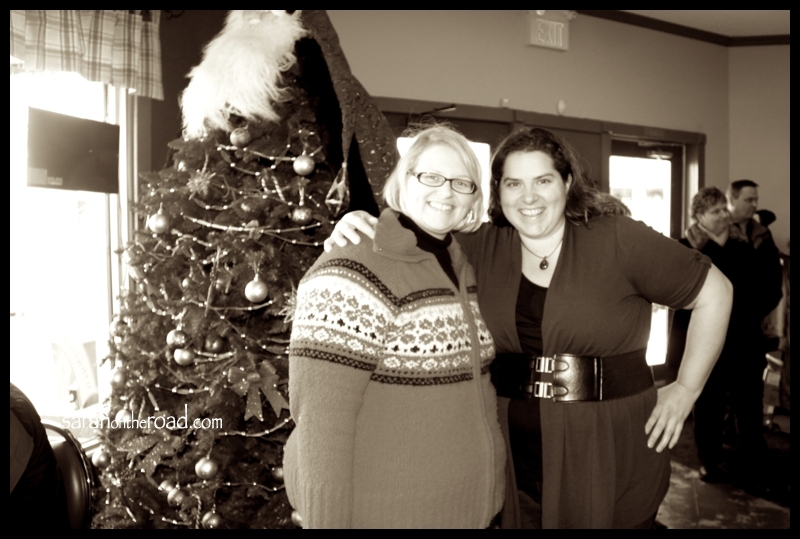 Today I got to meet Tas and catch up with Krista…it was a fun morning. 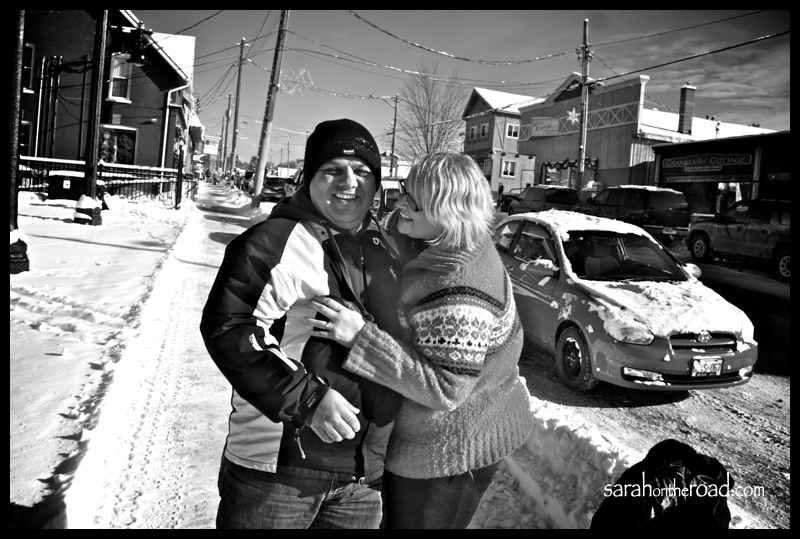 We met at the Kozy Korner for brunch… and to catch up… then headed down to the docks for a spontaneous photo shoot! 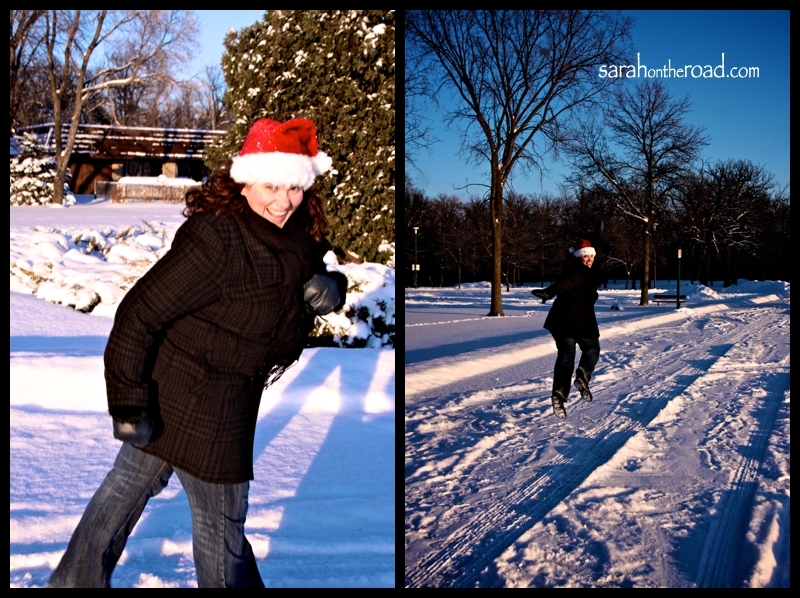 Even though it was like -20C Tas was an amazing sport.. and enjoyed walking down in his borrowed-heavy-duty-snow-boots! 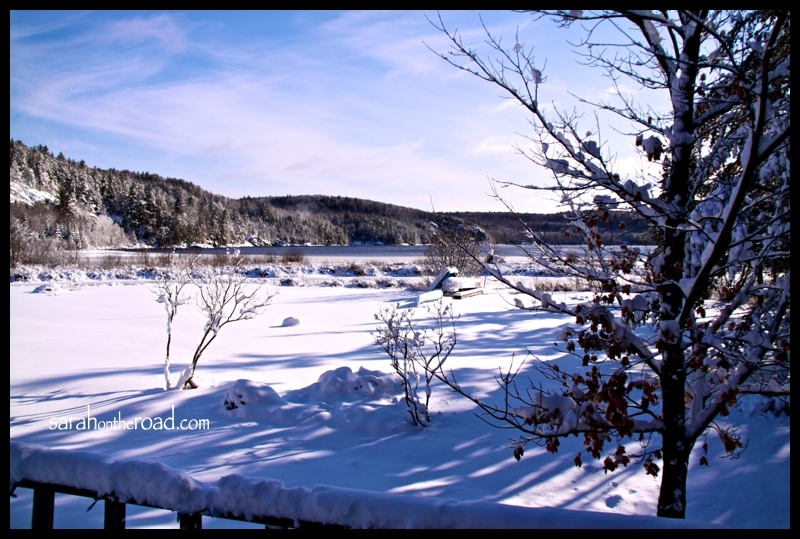 It’s funny how quickly a romantic moment can be made into a crazy-snow-fight!!! 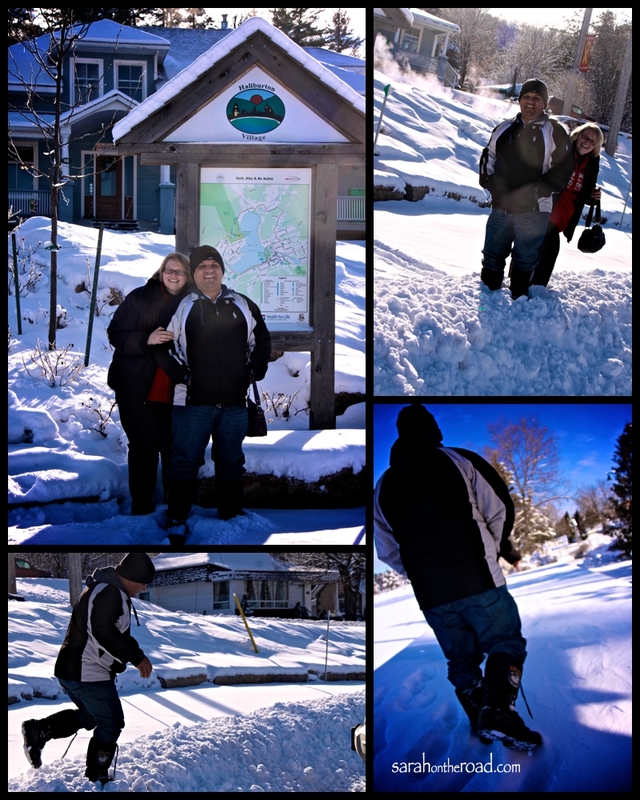 Well I guess if you give a girl-some-mittens…she has to show her new Aussie husband the joys of a winter wonderland. Tas was such a great sport, and love both his and Krista’s facial reactions. 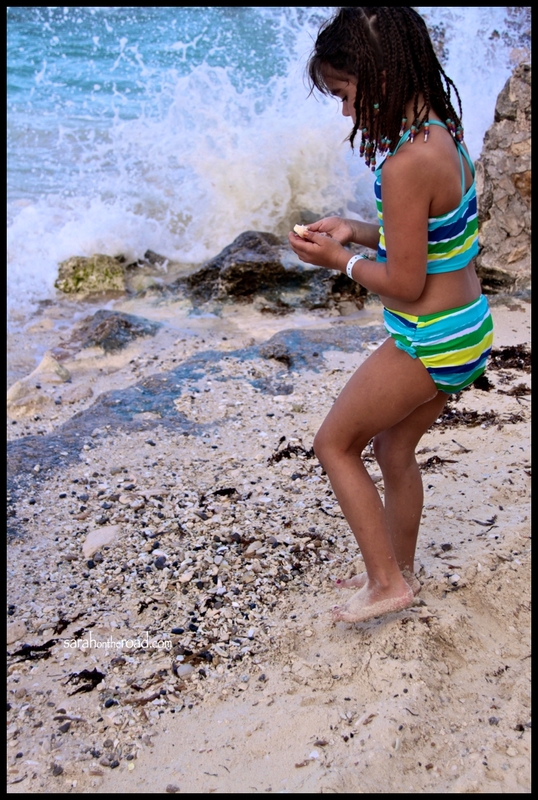 Then the tables were reversed… and well Tas needed no prompting to ‘snow’ her! 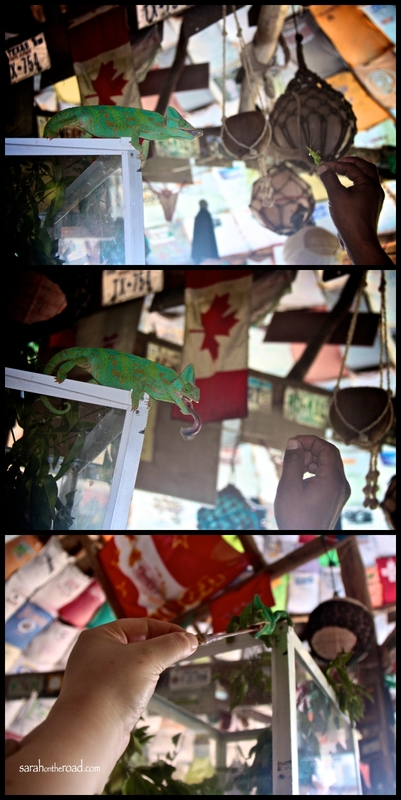 It was awesome to meet Tas… It was so nice to see you so HAPPY and in LOVE! Evidence from the fight…. 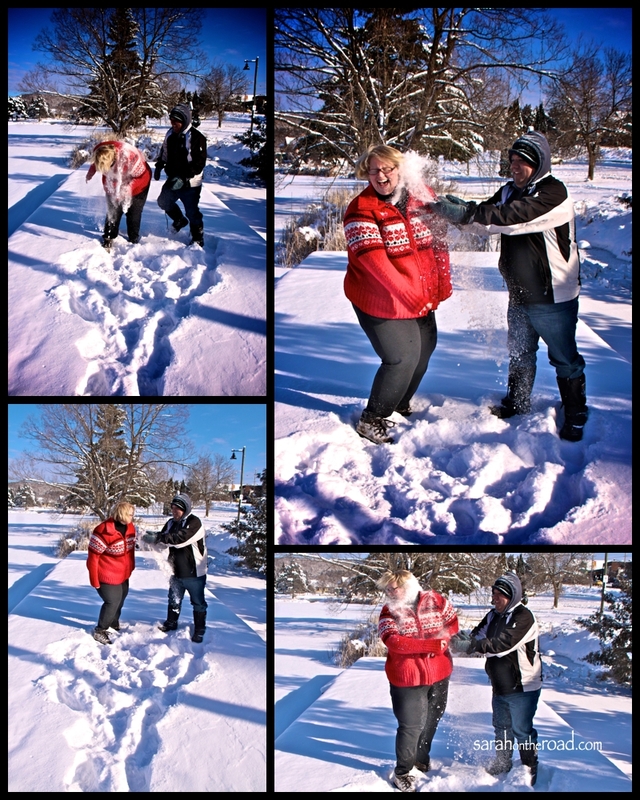 Krista for your next snowball fight… I’d make sure Tas was on your team! He’s got some mad skillz…for an Aussie Bloke. It was so nice to see you… and hopefully next time we touch base, will be in your hometown of Melbourne, Australia! 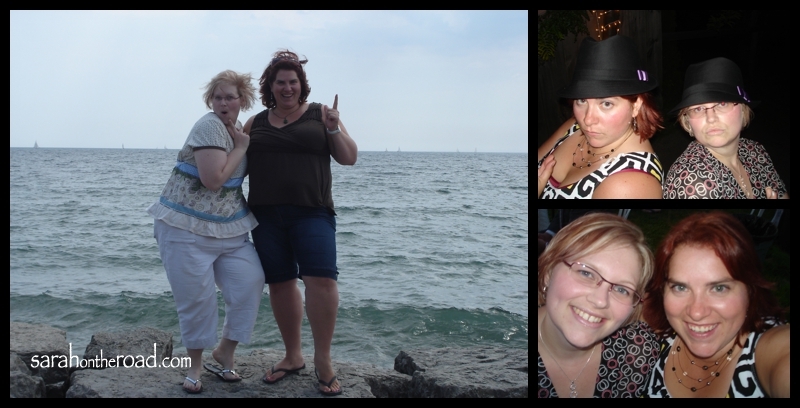 I’m blessed to know that our “friendship is a promise made in the heart, unbreakable by distance, unchangeable by time” (Michael Macone) …thanks for being my 4EVER Friend! Enjoy your last weeks in Canada before you head back to the land down under. 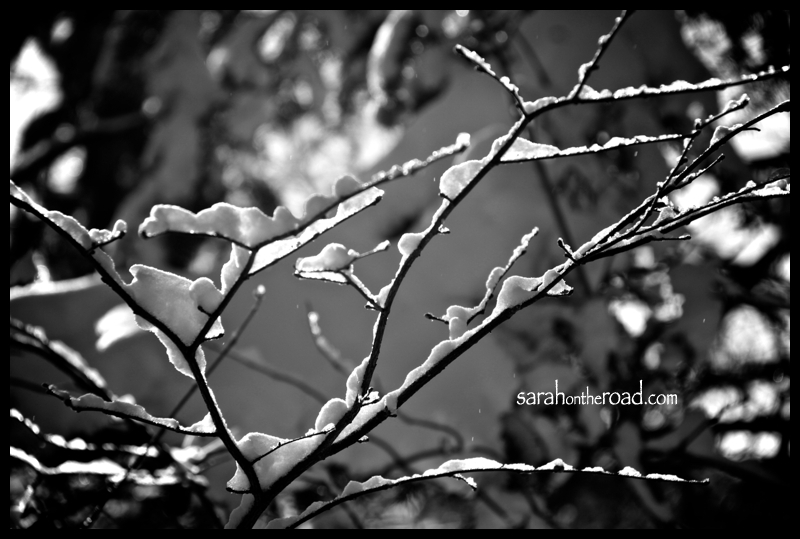 This entry was posted in Friends on December 29, 2011 by Sarah on the Road. 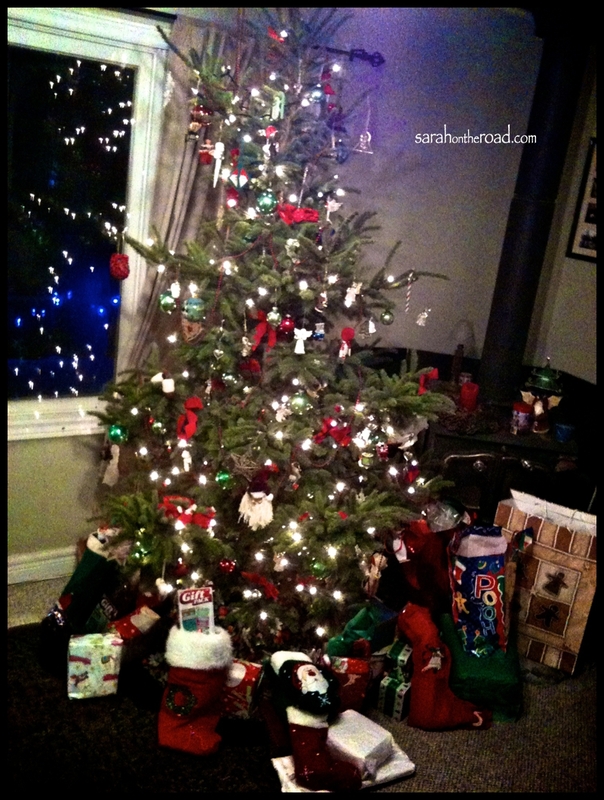 Sending you heaps of love from my house to yours! 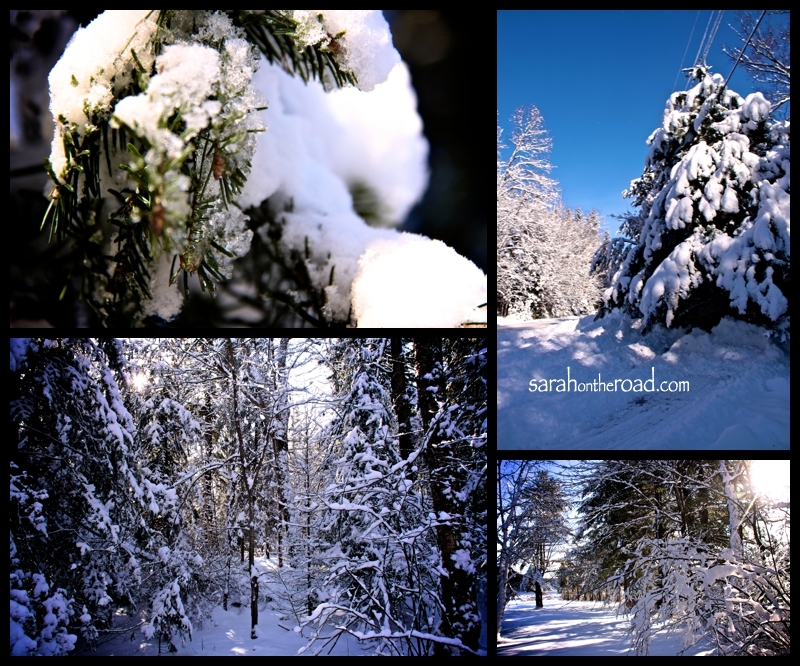 This entry was posted in Christmas, Holidays on December 25, 2011 by Sarah on the Road. 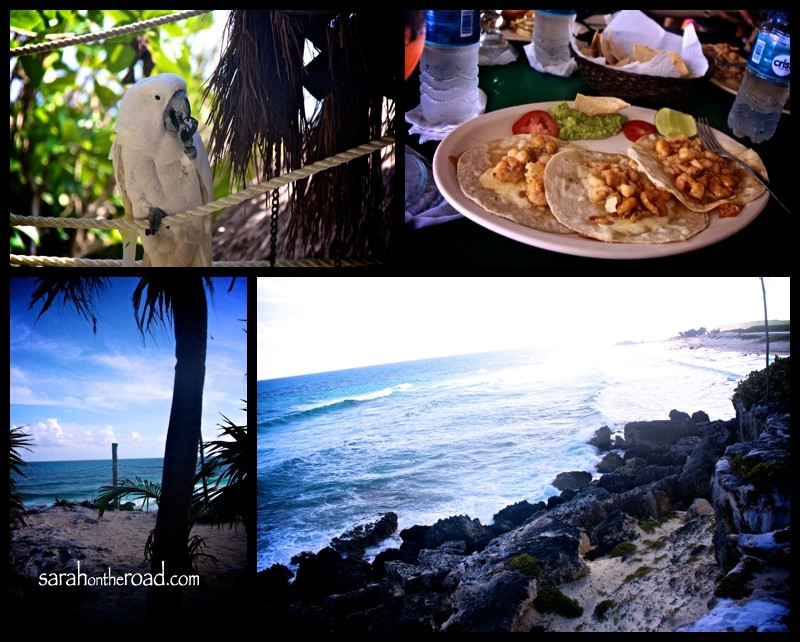 It was a fun filled week in the sun spent with some great friends… over the week I took a pile of photos and this post will show some of them-so bare with me.. I flew on my Birthday to Toronto, was met at the airport by Kat and my mum. When I got back to Kat and John’s place… I was surprised with a HUGE platter of sushi, and birthday cake. It was such a fabulous surprise, I’m so blessed with such a thoughtful family. 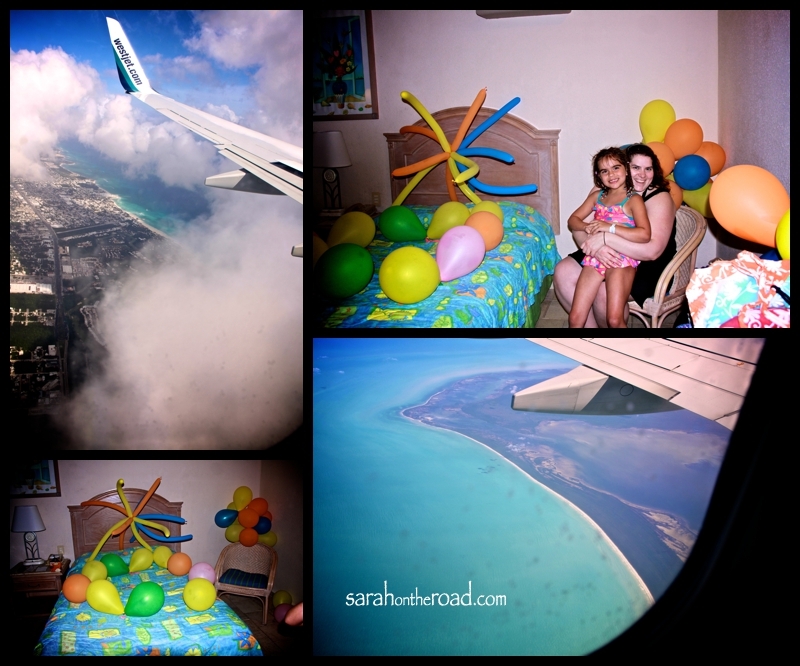 I was surprised with BALLOONS on my bed to help celebrate my birthday…Thanks to Katie! It was another great surprise to walk in and see my bed covered with balloons. 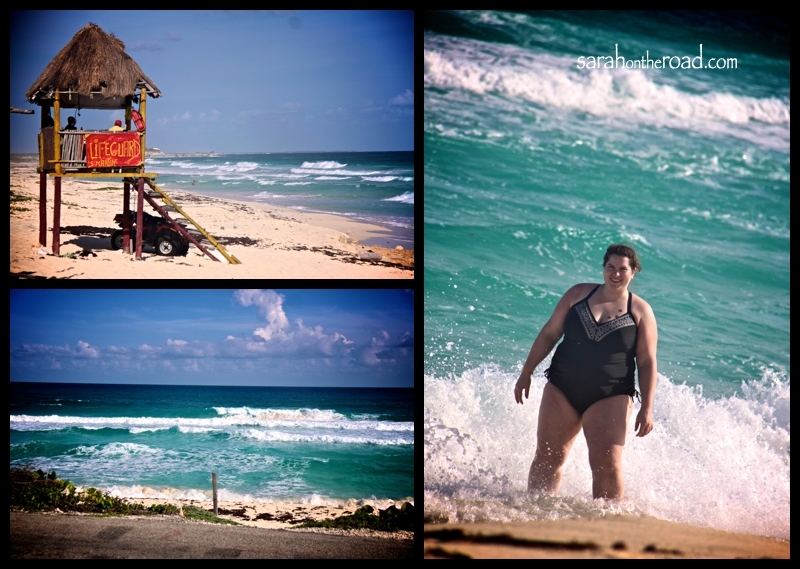 It was fabulous to walk on the beach, with the smell of the ocean and sand under my feet! 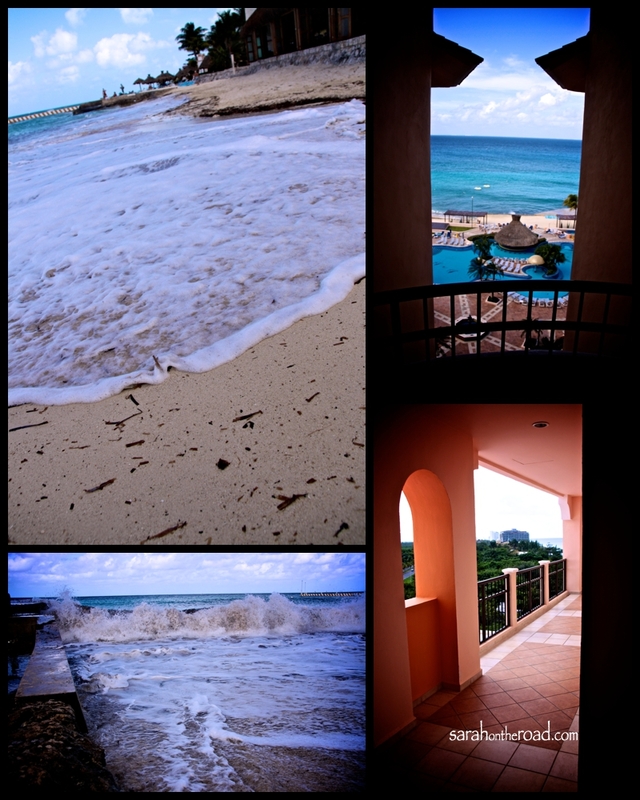 I stayed at the El Cozumeleno Beach Resort it was fabulous, the people who worked there are amazing! 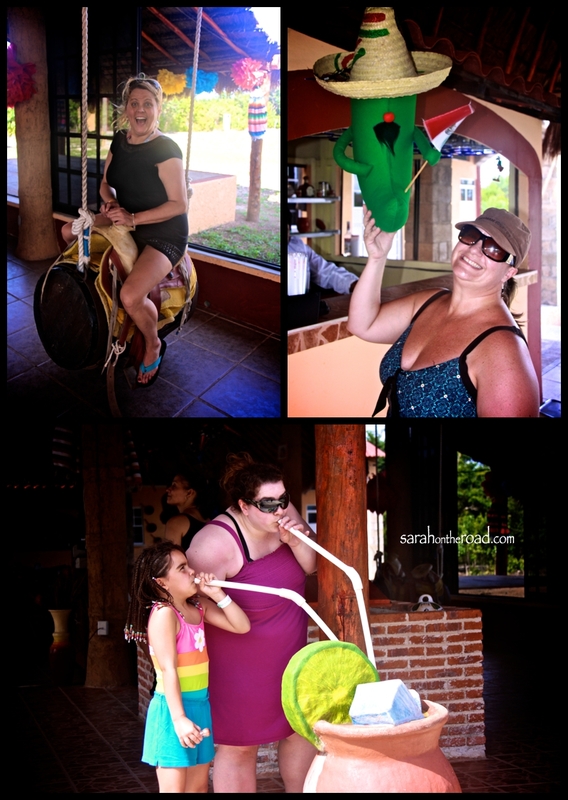 It was a fun family friendly resort…the poolside was so nice. 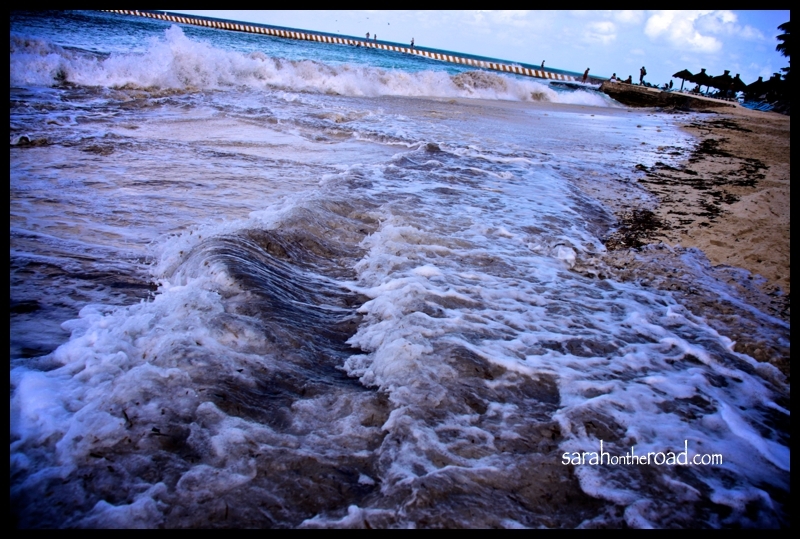 The beach wasn’t a ‘sandy’ so you can walk in (but if you went on the other side of the pier you could easily walk in). 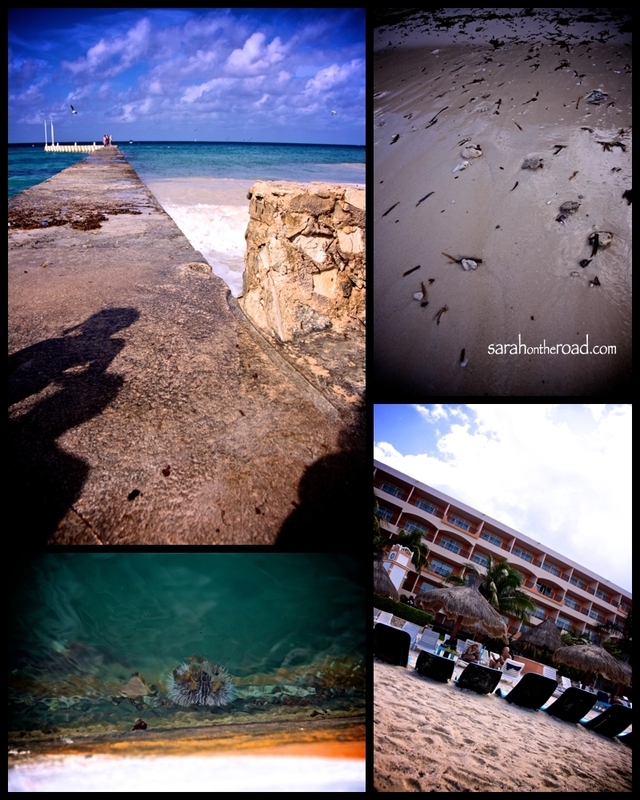 But once you got over the rock/coral at the shore.. it had FABULOUS snorkeling right in front of the resort! 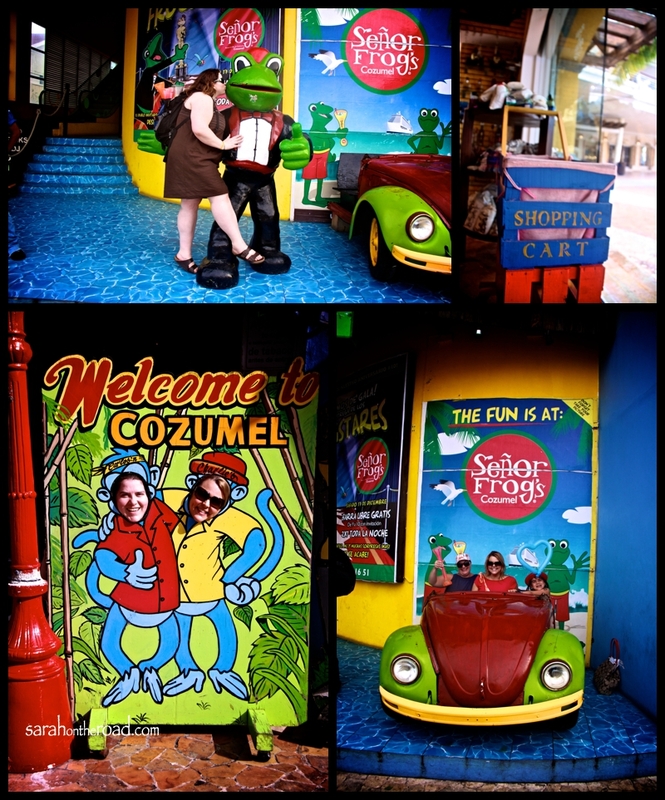 On Dec 15th…we headed into town to do some shopping and sight seeing. 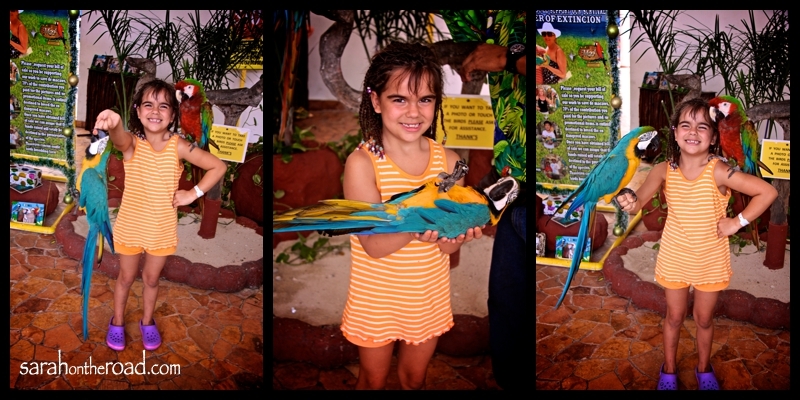 Katie made friends with these parrots! 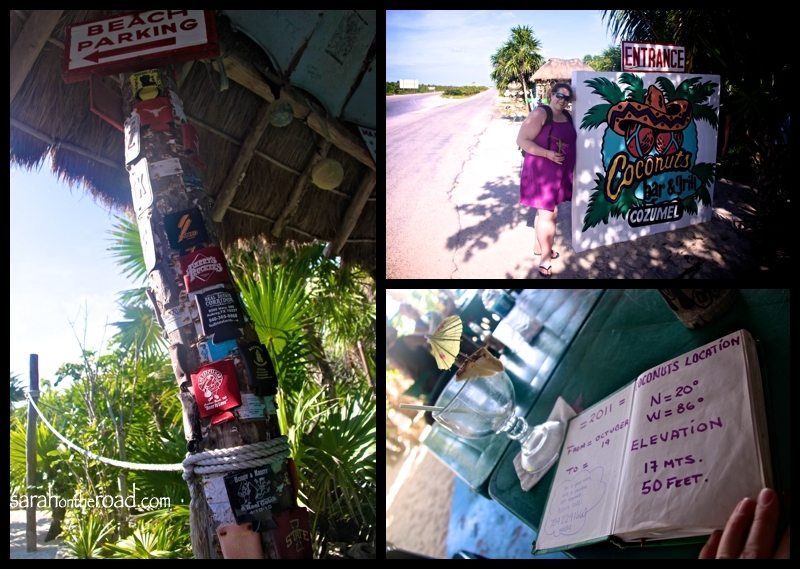 It was such a fun filled afternoon…stoping by Carlos’n Charlies for a bite to eat…and some more birthday celebrations! 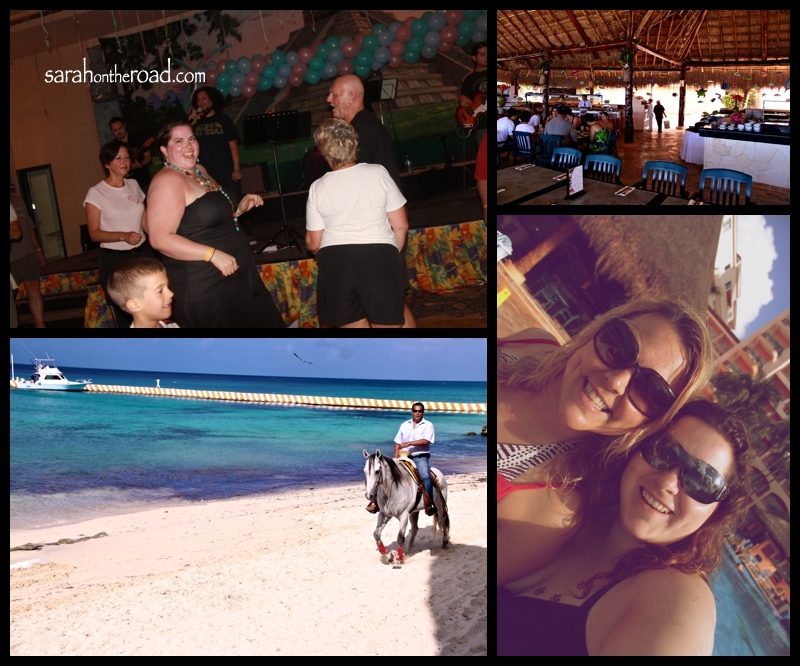 There was a few cruise ship groups there and the party was in full swing when we came! A few of us in the group got some henna tattoos that last about 2 weeks–on Facebook you probably saw mine. 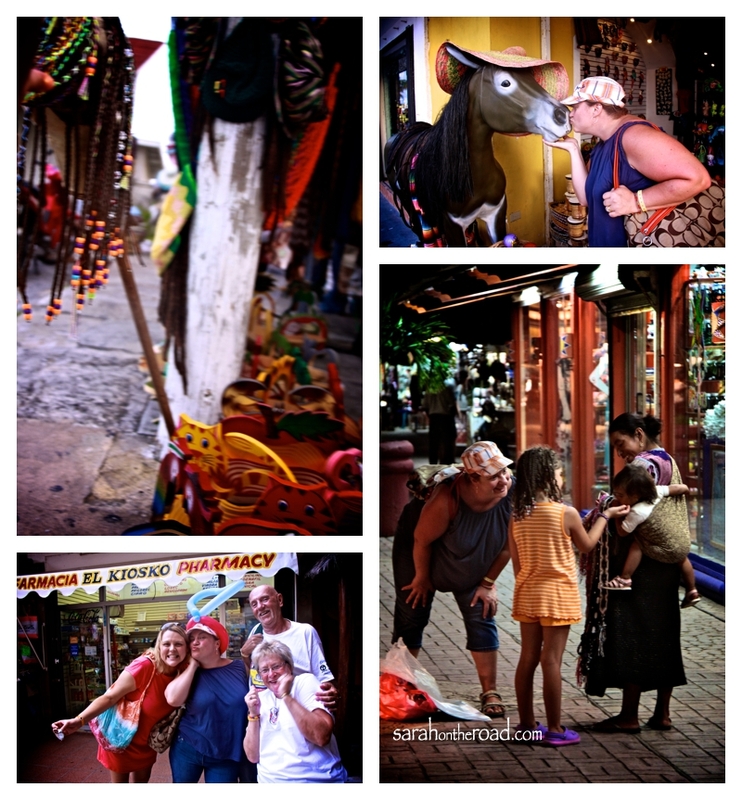 Walking around the streets…there were tons of spots for photo ops! 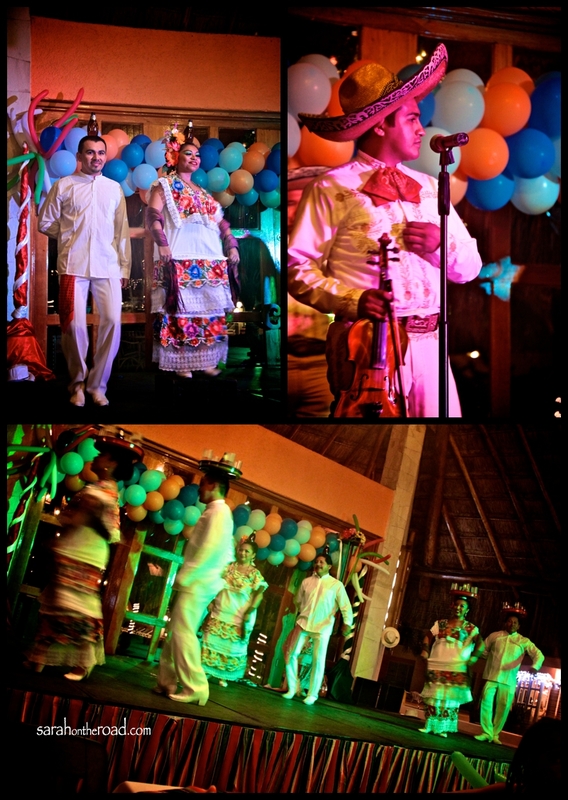 When we came home from the afternoon in town… after a brief siesta…we went for dinner, and the Mexican Cultural night! 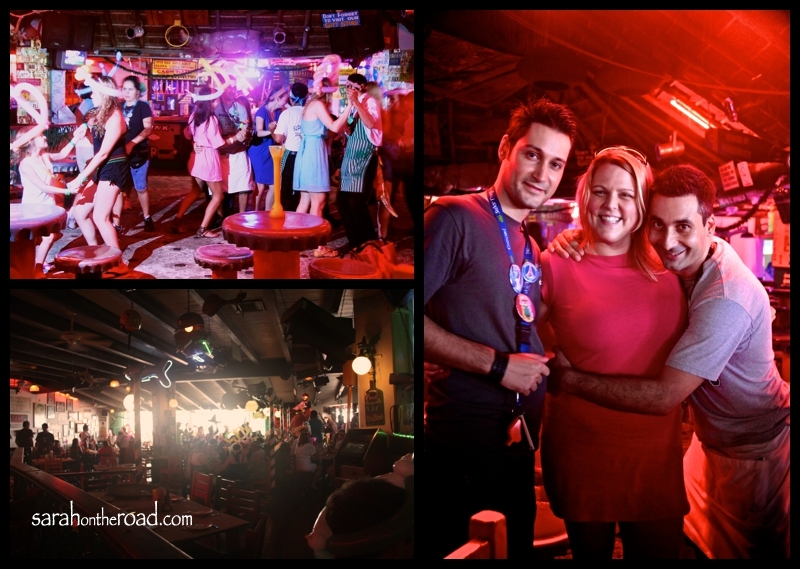 Awesome music, and dancing performances–I can’t believe that those ladies danced with bottles, trays filled with glasses and bottles and candles that were burning on their HEADS! 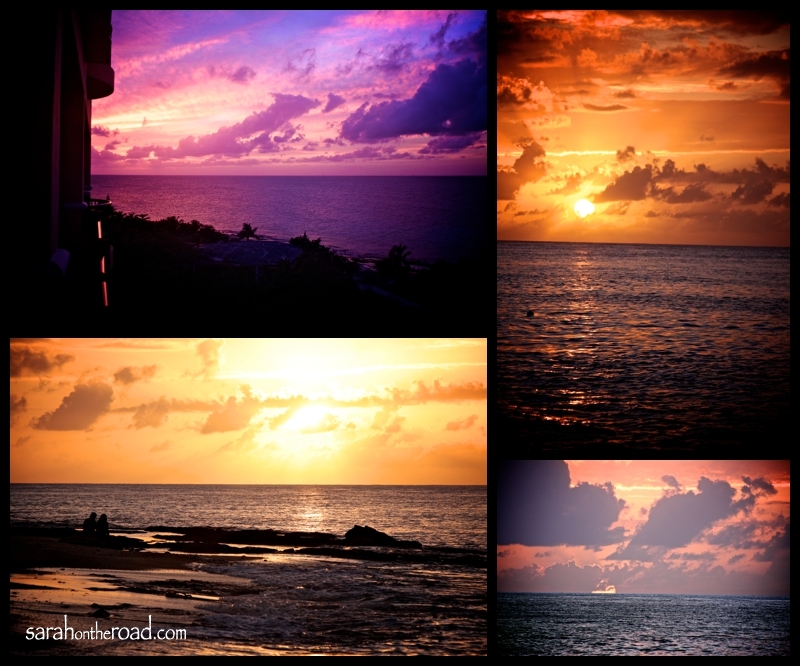 The sunsets were amazing…every night different colours were painted on the horizon, as the sun went down! 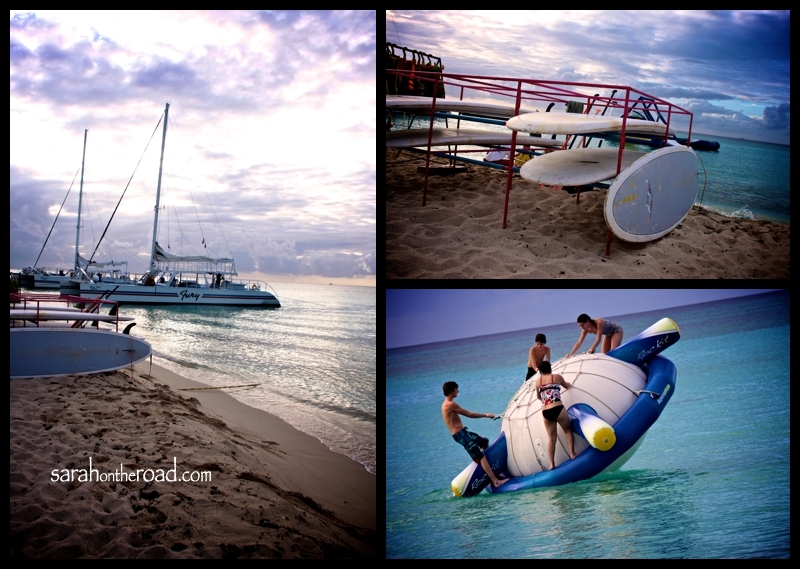 On December 17th… Jason and Kim took us to the “other side” of the island..where there is no cell reception or power! 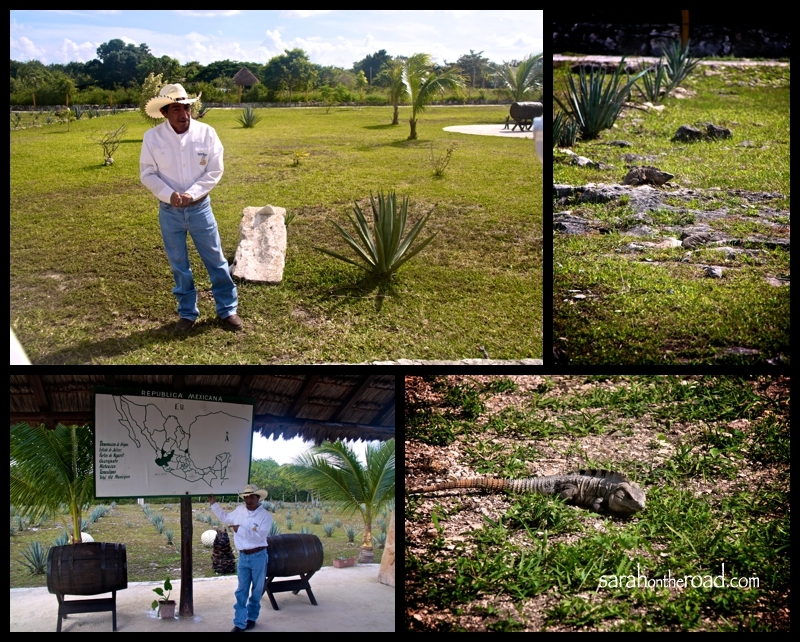 On our way there we stopped for a tour at this Tequila Place. 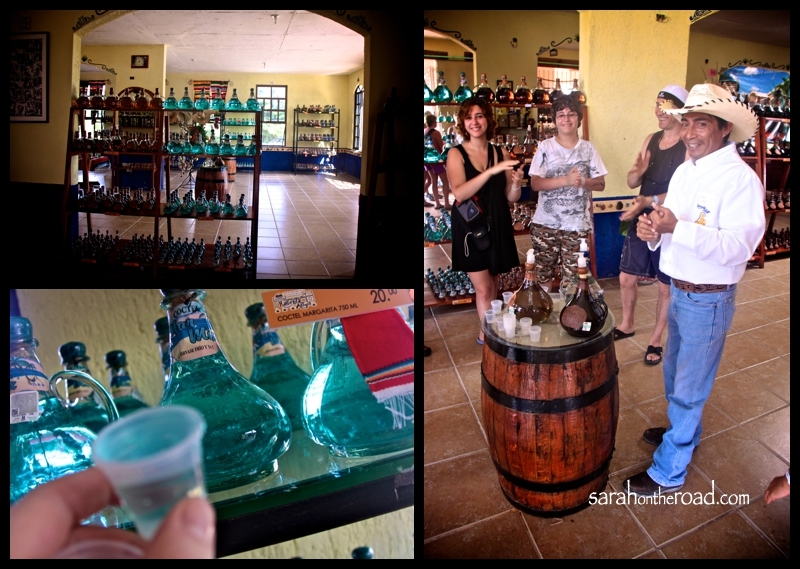 I learned lots of facts about Tequila-it’s history, how it was made…and of course had a few samples! Casper our guide…was so knowledgeable and provided tons of information! 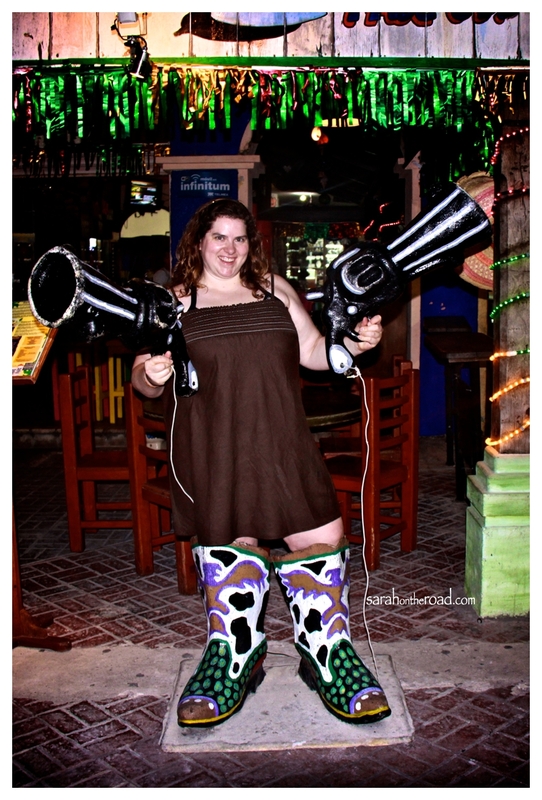 You never know what fun you’ll get into after a tequila tasting…. Leaving the Tequila Tour we saw this SIGN… have to love Mexico, and their fun signs… glad to know I could have had a “Free Pee-Pee Station”, if I needed! 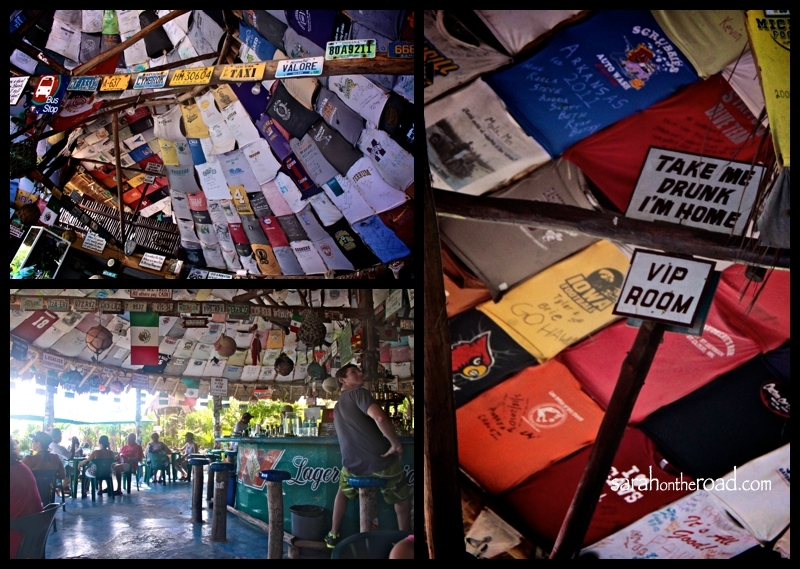 Our next stop of the day was Coconuts for some refreshment and lunch… it was a fun vibe being there… filled with shirts, and other paraphernalia that people have left behind. Totally reminded me of some of the bars I had been while travelling in Australia…while travelling up to the Alice Springs from Adelaide. 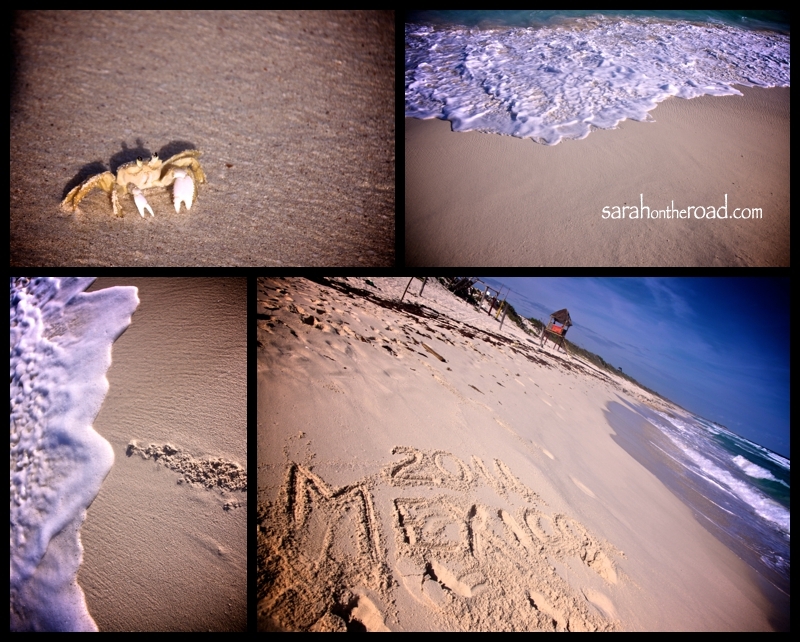 Beaches are something I love.. the surf, the salt smell…the random crabs running around! So in this photo of me you can see my “tattoo”…3 foot prints-that look more like paw prints… Fun for a holiday, but not for all time! I will get my ‘real’ tattoo at some point…but it won’t be paw prints and it won’t be on that location on my body! 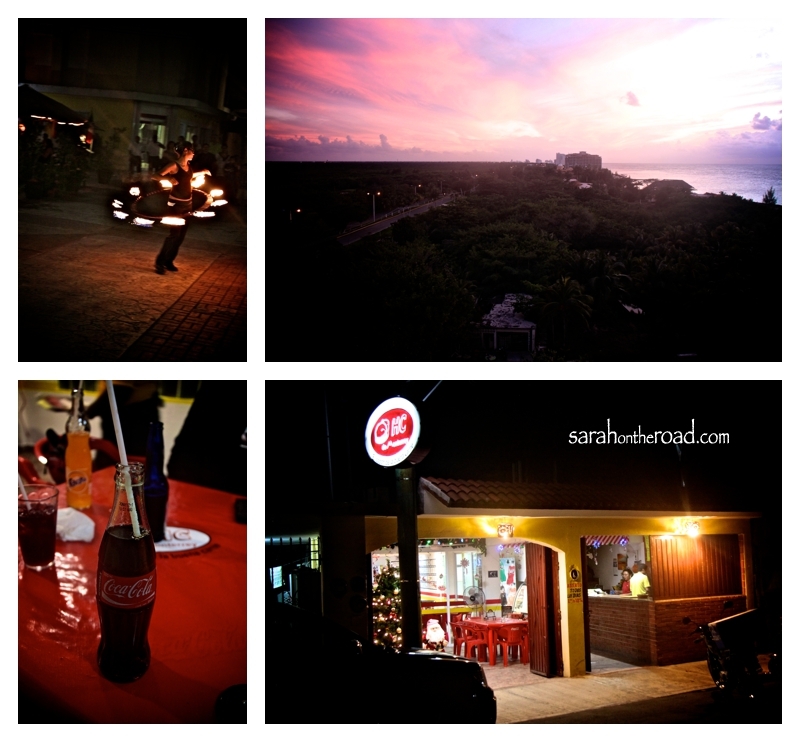 All dressed up… ready to head to Senor Frogs 10th Anniversary, another fun night ended by tacos by the “biker” bar… A beautiful sunset, dinner at a local steak place, coco-cola in a glass bottle with a straw and street performers in the square! Great memories of a wonderful Sunday night. This is an amazing artist… working at the corner of the square…to watch him create a beautiful works of art out of spray paint and paper! My one regret is not getting one of his paintings…next time! 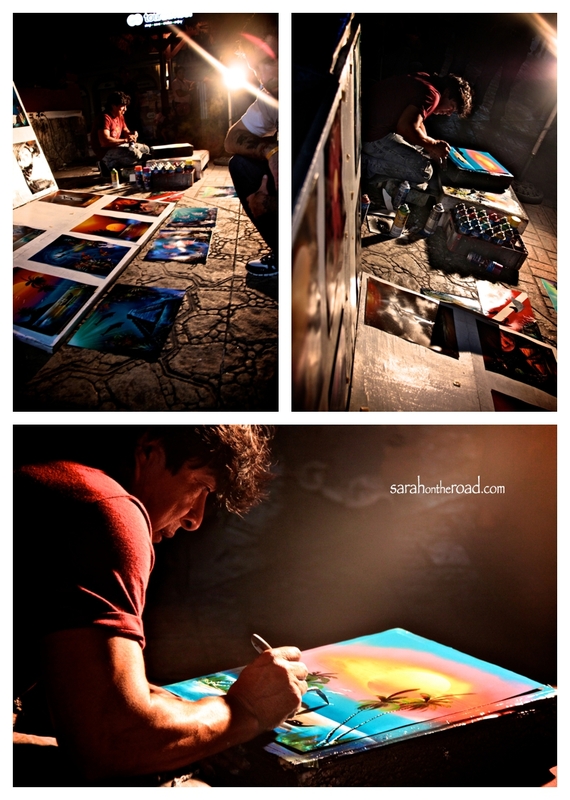 These shots were of him creating a piece of art for Dorothy. 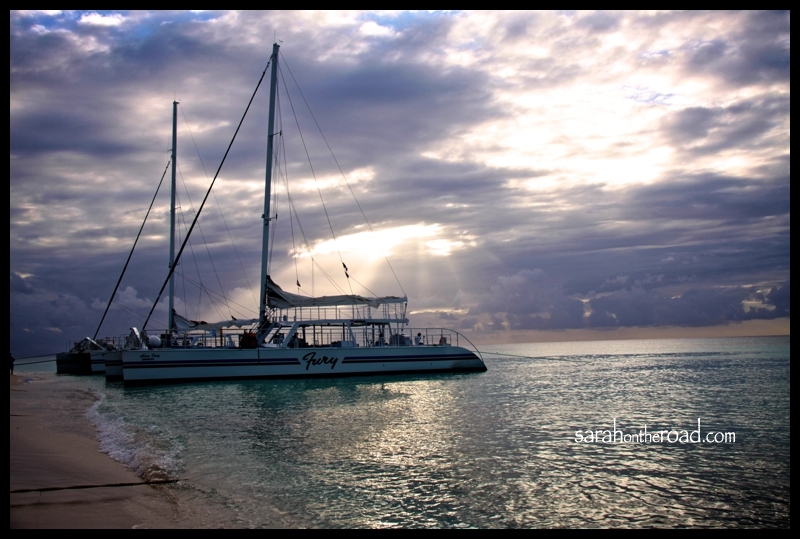 On Monday December 19th… we went on a snorkelling tour with Fury Catamarans! 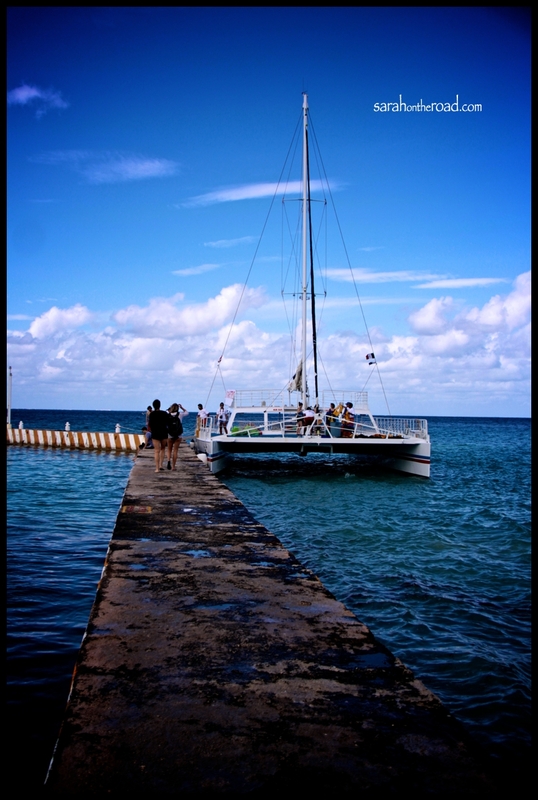 It was a fun afternoon… walking out to the catamaran. 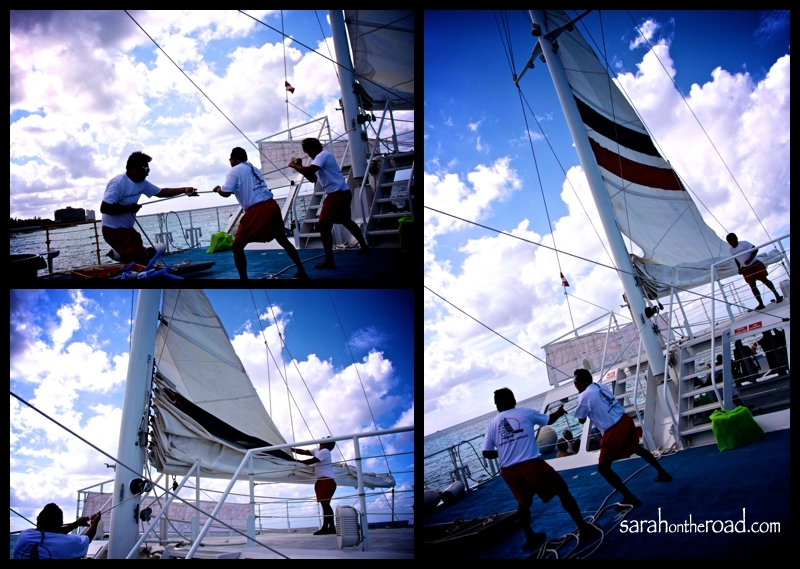 I don’t know about you…but you need to be “always prepared to snorkel!” The Captain of the boat… steered like this all the way… I kind of liked his style! After stopping at our two different reefs to do some snorkelling (which made me wish I was actually diving, not just floating on the surface! 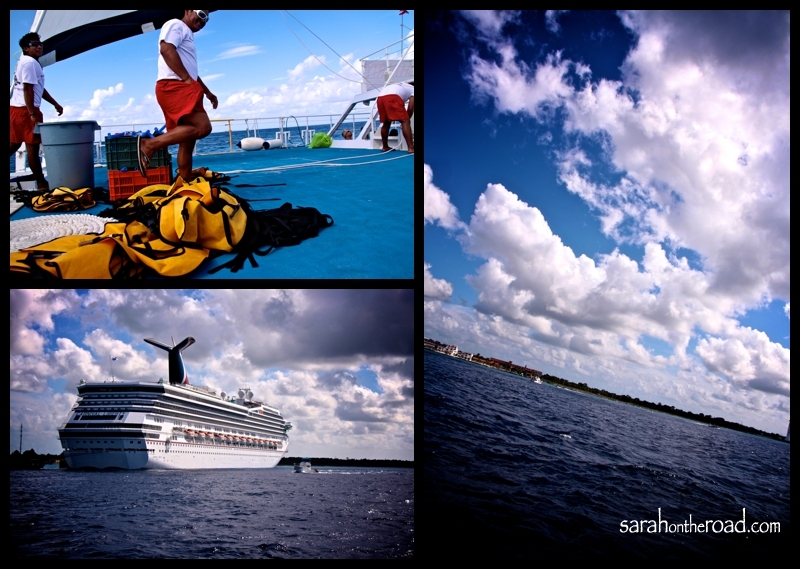 )… and remember–“follow the big Buoy” heaven forbid if we could snorkel outside of the ‘pack’! 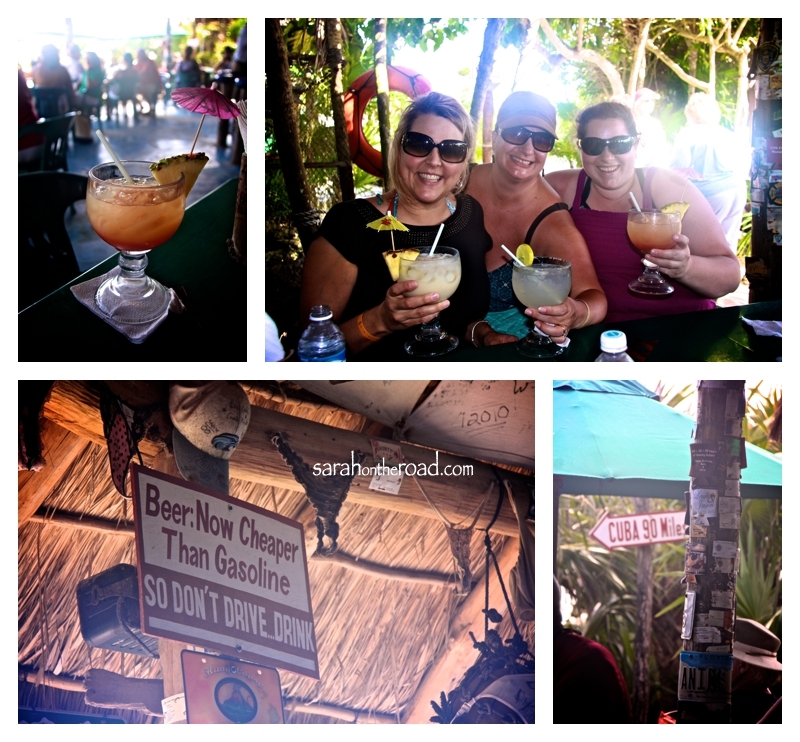 We headed to the “Beach Party spot” for a cheese burger, salads and more drinks… there were fun water blow-up things to play with…but I just watched! 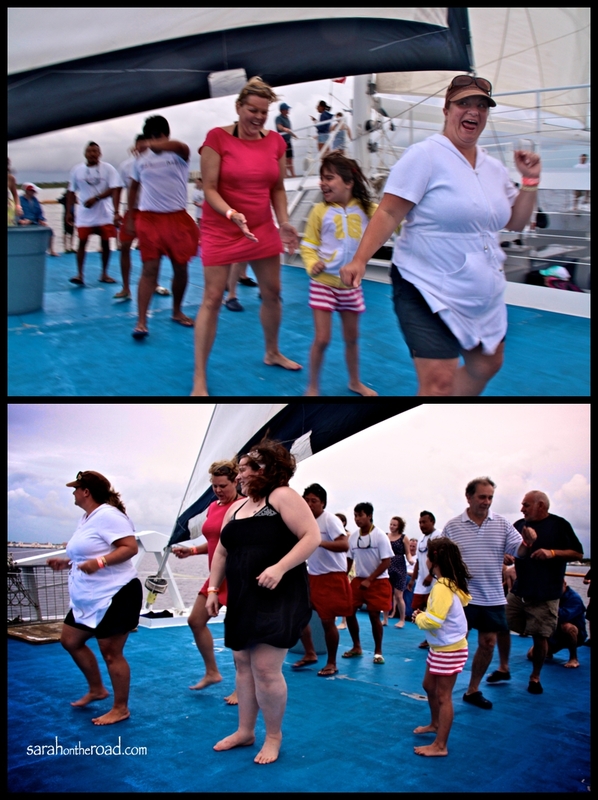 Back on the boat and heading home… the ‘dance-floor’ opened up… and we had a blast, dancing while the boat cruised over the waves. Dorothy thanks for being an awesome roommate… it was great meeting you, and all the best as you go on your next adventure in Alberta! 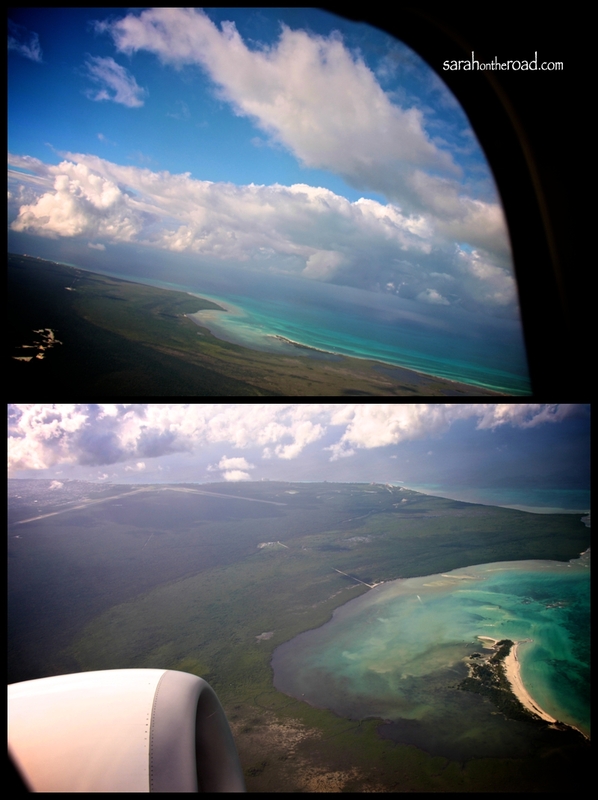 Looking out the window as I left Cozumel, Mexico…. in the distance you can see the towers of the resort I stayed at! 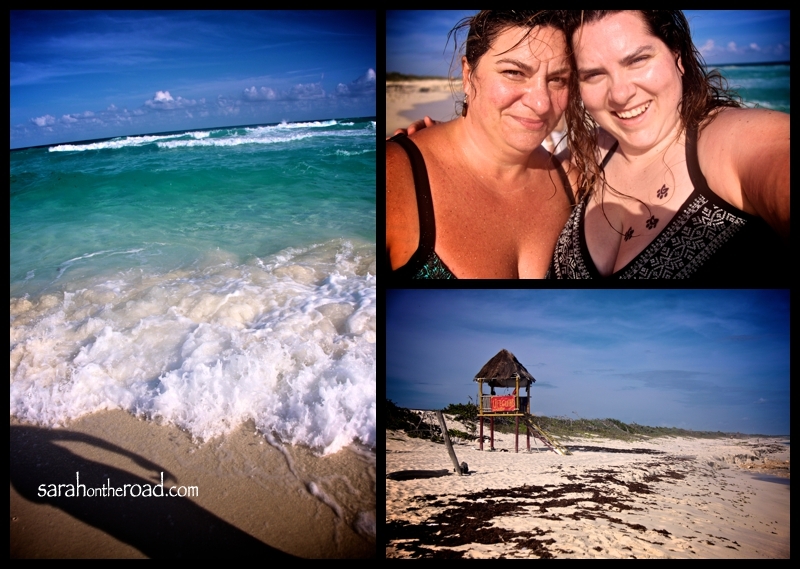 What a fabulous vacation in the sun…it was everything I needed and even more! 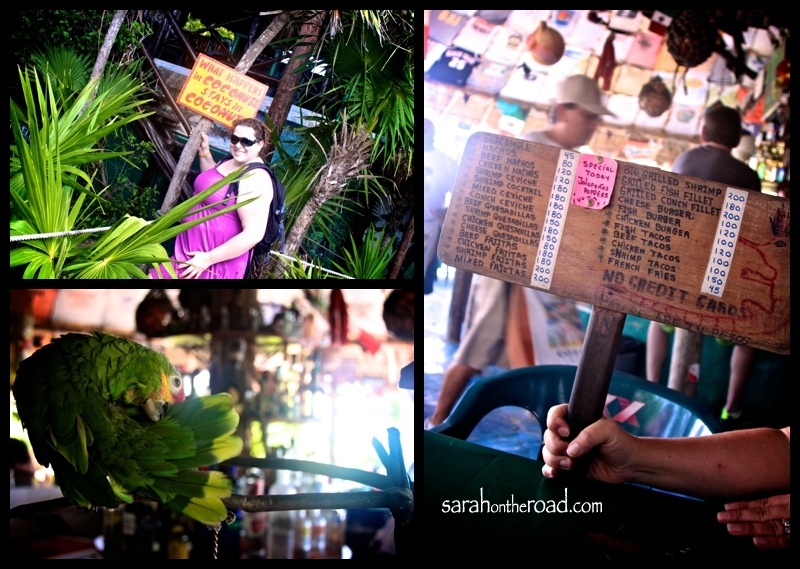 This entry was posted in Holidays, International Travel on December 23, 2011 by Sarah on the Road.